Republican Sens. Tom Cotton (Ark.) and Orrin Hatch (Utah) on Monday introduced the Iranian Leadership Asset Transparency Act, which would require the U.S. Treasury to report on the assets of key Iranian officials. 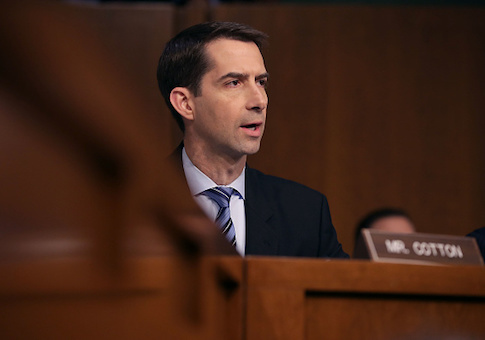 According to the press release from Cotton's office, the bill will have the Treasury provide reports on Iranian ayatollahs' assets in an attempt to expose how they have corruptly managed the country's economy. "This report will expose to all the world just how badly the ayatollahs have mismanaged the Iranian economy and just how much money they’ve stolen from the Iranian people," Cotton said. "For too long, they’ve lived lavishly while their own people have suffered, and it’s time we shine a bright line on this corruption." Hatch said the legislation will give the public information about how Ayatollah Khamenei has profited at Iranians' expense. "I am pleased to join Senator Cotton in introducing the Iranian Leadership Asset Transparency Act, a bill that calls for the public release of information concerning the fortunes that line the coffers of Ayatollah Khamenei and his regime," Hatch said. "By educating the public about the Iranian government’s profiteering at the expense of its own people, this proposal will aid Iranians in their quest for freedom and prosperity." A companion bill passed the House of Representatives in December. It was sponsored by Rep. Bruce Poliquin (R., Maine). This entry was posted in Uncategorized and tagged Iran, Orrin Hatch, Tom Cotton. Bookmark the permalink.